A material’s hazard class reflects the risks associated with it. There are nine different hazard classes. The types of materials included in these nine classes are in Figure 9.1. Identification numbers are a four-digit code used by first responders to identify hazardous materials. An identification number may be used to identify more than one chemical. The letters “NA or “UN” will precede the identification number. The United States Department of Transportation’s Emergency Response Guidebook (ERG) lists the chemicals and the identification numbers assigned to them. The Hazardous Materials Table. Figure 9.4 shows part of the Hazardous Materials Table. Column 1 tells which shipping mode(s) the entry affects and other information concerning the shipping description. The next five columns show each material’s shipping name, hazard class or division, identification number, packaging group, and required labels. (+) – Shows the proper shipping name, hazard class, and packing group to use, even if the material doesn’t meet the hazard class definition. (A) – Means the hazardous material described in Column 2 is subject to the HMR only when offered or intended for transport by air unless it is a hazardous substance or hazardous waste. (W) – Means the hazardous material described in Column 2 is subject to the HMR only when offered or intended for transportation by water unless it is a hazardous substance, hazardous waste, or marine pollutant. (D) – Means the proper shipping name is appropriate for describing materials for domestic transportation, but may not be proper for international transportation. (I) – Identifies a proper shipping name that is used to describe materials in international transportation. A different shipping name may be used when only domestic transportation is involved. Column 4 lists the identification number for each proper shipping name. Identification numbers are preceded by the letters “UN” or “NA.” The letters “NA” are associated with proper shipping names that are only used within the United States and to and from Canada. The identification number must appear on the shipping paper as part of the shipping description and also appear on the package. It also must appear on cargo tanks and other bulk packaging. Police and firefighters use this number to quickly identify the hazardous materials. Appendix A to 49 CFR 172.101 – The List of Hazardous Substances and Reportable Quantities. The DOT and the EPA want to know about spills of hazardous substances. They are named in the List of Hazardous Substances and Reportable Quantities. See Figure 9.5. Column 3 of the list shows each product’s reportable quantity (RQ). When these materials are being transported in a reportable quantity or greater in one package, the shipper displays the letters RQ on the shipping paper and package. The letters RQ may appear before or after the basic description. You or your employer must report any spill of these materials, which occurs in a reportable quantity. 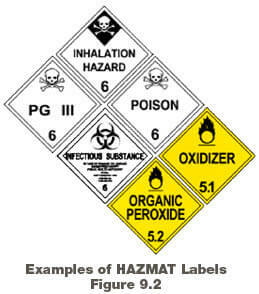 If the words INHALATION HAZARD appear on the shipping paper or package, the rules require display of the POISON INHALATION HAZARD or POISON GAS placards, as appropriate. These placards must be used in addition to other placards, which may be required by the product’s hazard class. 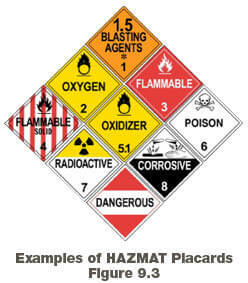 Always display the hazard class placard and the POISON INHALATION HAZARD placard, even for small amounts. Appendix B to 49 CFR 172.101 – List of Marine Pollutants. Appendix B is a listing of chemicals that are toxic to marine life. For highway transportation, this list is only used for chemicals in a container with a capacity of 119 gallons or more without a placard or label as specified by the HMR. Identified by an “X” placed before the shipping description (ID#, Shipping Name, Hazard Class, Packing Group) in a column captioned “HM.” The letters “RQ” may be used instead of “X” if a reportable quantity is present in one package. The number of an agency or organization capable of, and accepting responsibility for, providing the detailed information. The person who is registered with the ERI provider must be identified by name, or contract number or other unique identified assigned by the ERI provider, on the shipping paper. 10 ctns. UN1263, Paint, 3, PG ll, 500 lbs. UN1090, Waste Acetone, 3, PG ll. A non-hazardous material may not be described by using a hazard class or an identification number. Shippers must keep a copy of shipping papers (or an electronic image) for a period of 2 years (3 years for hazardous waste) after the material is accepted by the initial carrier. If one provides a carrier service only and is not the originator of the shipment, a carrier is required to keep a copy of the shipping paper (or electronic image) for a period of 1 year. When the shipper packages hazardous materials, he/she certifies that the package has been prepared according to the rules. The signed shipper’s certification appears on the original shipping paper. The only exceptions are when a shipper is a private carrier transporting their own product and when the package is provided by the carrier (for example, a cargo tank). Unless a package is clearly unsafe or does not comply with the HMR, you may accept the shipper’s certification concerning proper packaging. Some carriers have additional rules about transporting hazardous materials. Follow your employer’s rules when accepting shipments. The hazardous material’s shipping name and identification number. Except for bulk packaging, the hazard classes in Table 2 need placards only if the total amount transported is 1,001 pounds or more including the package. Add the amounts from all shipping papers for all the Table 2 products you have on board. See Figure 9.8. Bulk packaging is a single container with a capacity of 119 gallons or more. A bulk package, and a vehicle transporting a bulk package, must be placarded, even if it only has the residue of a hazardous material. Certain bulk packages only have to be placarded on the two opposite sides or may display labels. All other bulk packages must be placarded on all four sides.